Ocean Mist Small Floating Fountain with 48 White LED Lights and 600GPH Submersible Pump for Ponds, WaterGardens and Swimming Pools | Fountain City Art Ctr. Ocean Mist Small Floating Fountain with 48 White LED Lights and 600GPH Submersible Pump for Ponds, WaterGardens and Swimming Pools by Ocean Mist at Fountain City Art Ctr.. MPN: SMFFWHITE. Hurry! Limited time offer. Offer valid only while supplies last. Floating Fountain with White LED Lights make this fountain an must have addition to any pond. It adds beauty during the evening hours and overnight. Floating Fountain with White LED Lights make this fountain an must have addition to any pond. It adds beauty during the evening hours and overnight. Low electricity costs make this unit very attractive and affordable to operate. Light up the night with a White LED floating fountain from Ocean Mist. 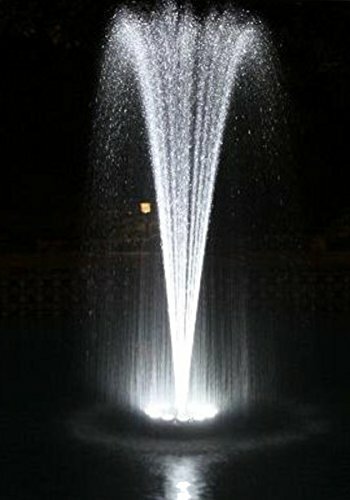 Floating LED Lighted Fountain Floating water fountain with 48 LED light ring and 600 gph UL water pump. Size: 11" (buoy dia.) x 6" (h) Fountain spray height: 30"-36" and width: 24"-30". LED lights are super bright and available all white (this listing) or multi-color lights. Simply put it in water, then plug, it is easy to relocate and no hardware installation required. Great for display in pond, party event or it can sit on top of the regular fountain to make a beautiful lighted water spray. The pump and LED lights have 1 year warranties. Creates a beautiful fountain display in pools, spas, ponds or water gardens. White LED lights create a night time water display. Fountain water spray is approximately 40" high, 30" diameter, adjustable. Installation is ultra simple and easy: connect the pump, float the fountain into place and plug it in! 600 GPH, 60 Watt Pump; Engineered For Continuous Use; 48 LEDs - White; Adjustable Fountain Nozzle; Float Size: 13.5" x 2.5"; Pump Extends 8" Below Float; 2 - 30' Power Cords; Low Voltage Transformer; 1 Year Warranty. If you have any questions about this product by Ocean Mist, contact us by completing and submitting the form below. If you are looking for a specif part number, please include it with your message.